Violinist Natasha Lipkina continues to captivate audiences with her vivacious and charismatic performances throughout the world. Interwoven with great intelligence and sensitivity, her unique approach to programming allows her listeners to be both Inspired and challenged. Bonduryansky, Tatiana Gaidamovich and Miriam Fried. 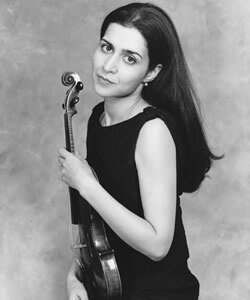 While at Indiana University, she began to study viola with Atar Arad and made her viola debut in the Dubinsky Quartet later that year. Natasha has performed as a recitalist in Russia and other countries in the former Soviet Union and as a soloist with orchestras and in Russia, Romania, Germany, Finland, Japan, and the United States. She has since participated in numerous festivals including Marlboro, Norfolk, Grand Teton, Rauma (Finland), Waterloo (Belgium), Musique et Amitié (Switzerland), Southampton Arts and others. In addition, she has performed with the St.Luke’s Orchestra, the Mahler Chamber Orchestra (with Claudio Abbado), SONYC, and other ensembles. She has made several tours in Japan with NY Symphonic Ensemble. She won top prizes in the Enescu Violin Competition (Romania) and in the Shostakovich Chamber Music Competition (St.Petersburg). Natasha’s performances have been broadcast on Russian Radio and TV and on WQXR in New York She has been recorded on Sony and other established labels, and on numerous soundtracks for movies. She was featured as a viola soloist in the documentary “Dance Maker” about the Paul Taylor Dance Company.